This privacy notice (Privacy Notice) sets out the ways in which we, The Society for Theatre Research (we, us, our), collect and use your personal data (your personal information) in connection with our charity, including via our website str.org.uk It also explains what rights you have to access or change your personal data. (o) volunteer or work with us, including as a supplier, a committee member, lecturer, presenter, trustee or treasurer;. (q) ‘follow’, ‘like’, post to or interact with our social media accounts, including Facebook and Twitter. (f) Sensitive “special category” information: in certain circumstance, you may provide us with details of particularly sensitive information, for instance about your race or ethnicity, religious beliefs, sexual orientation, health and whether or not you have any disability, for example, providing us with detail of any specific dietary requirements, or special adjustments we may need to make. (f) Technical data: we will also collect certain information about how you use our website and the device that you use to access our website, even where you have not created an account or logged in. This might include your geographical location, device information (such as your hardware model, mobile network information, unique device identifiers), the data transmitted by your browser (such as your IP address, date and type of the request, content of the request regarding the specific site, time zone settings, access status/HTTP status code, volume of data transmitted, browser type and version, language settings, time zone settings referral source, length of visit to the website, date and time of the request, operating system and interface) number of page views, the search queries you make on the website and similar information. 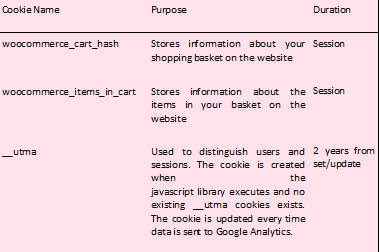 This information may be collected by a third-party website analytics service provider on our behalf and/or may be collected using cookies or similar technologies. For more information on cookies please read section 6 below. (h) Other third parties: we might also receive information about you from third parties if you have indicated to such third party that you would like to hear from us. 4.1.5 our legitimate interests or those of a third party. By “legitimate interests” we mean our interests in conducting and managing our charitable activities and to ensure that we are guaranteeing the best service and experience for you. Where we use your information for our legitimate interests, we make sure that we take into account any potential impact that such use may have on you. Our legitimate interests don’t automatically override yours, and we won’t use your information if we believe your interests should override ours unless we have other grounds to do so (such as when we have your consent, or we have a legal obligation to use your information in that way). If you have any concerns about our processing please refer to section 10 below. 4.3.5 less commonly, where it is needed in relation to legal claims or where it is needed to protect your interests (or someone else’s interests) and you are not capable of giving your consent, or where you have already made the information public. 4.4.25 Compliance with policies, procedures and laws: to enable us to comply with our policies and procedures and enforce our legal rights, or to protect the rights, property or safety of our staff and members and share your information with our technical and legal advisors (on the basis of our legitimate interests to operate a safe and lawful charity or where we have a legal obligation to do so). 5.1.8 Other third parties (including professional advisers): any other third parties (including legal or other advisors, regulatory authorities, courts, law enforcement agencies and government agencies) where necessary to enable us to enforce our legal rights, or to protect the rights, property or safety of our staff or where such disclosure may be permitted or required by law. 7.1.4 limiting access to your personal information to those in our organisation who need to use it in the course of their work. We will retain your information for as long as is necessary to provide you with the services that you have requested from us or for as long as we reasonably require to retain the information for our lawful purposes, such as for the purposes of exercising our legal rights or where we are permitted to do so. We operate a data retention policy and look to find ways to reduce the amount of information we hold about you and the length of time that we need to keep it. For more information on our retention periods, please contact us using the contact details provided in section 2 above. 8.1.6 keeping your devices protected by using the latest version of your operating system and maintaining any necessary anti-virus software. Our charity is located in the UK. 9.2.3 Where we use providers based in the US, we may transfer data to them if they are part of the Privacy Shield which requires them to provide similar protection to personal data shared between the Europe and the US. For further details, see European Commission: EU-US Privacy Shield. 9.3 Please contact us using the contact details at the top of this Privacy Notice if you want further information on the specific mechanism used by us when transferring your personal data out of the EEA. 10.3.1 You may exercise your rights above by contacting us using the details in section 2 of this Privacy Notice, by updating your online account details, or in the case of preventing processing for marketing activities also by checking certain boxes on forms that we use to collect your data to tell us that you don’t want to be involved in marketing. 10.3.2 You may contact us via the details at the top of this Privacy Notice if you wish to action any of these additional rights and we will comply with your requests unless we have a lawful reason not to do so. 10.4.1 We may need to request specific information from you to help us confirm your identity and to enable you to access your personal data (or to exercise any of your other rights). This is a security measure to ensure that personal data is not disclosed to any person who has no right to receive it. We may also contact you to ask you for further information in relation to your request to speed up our response. 10.4.2 You will not have to pay a fee to access your personal data (or to exercise any of the other rights). However, we may charge a reasonable fee if your request is clearly unfounded, repetitive or excessive. Alternatively, we may refuse to comply with your request in these circumstances. We will try to respond to all legitimate requests within one month. Occasionally it may take us longer than a month if your request is particularly complex or you have made a number of requests. In this case, we will notify you and keep you updated. You might end up providing personal information directly to third parties as a consequence of your interactions with our website and other services offered by us. For example, your name and other personal information may be shared with other website users when you post content on the website, or you may attend an event hosted by us where you communicate personal information directly with other attendees. We are not responsible for how such third parties use personal data provided by you. Please be responsible with personal information of others when using our website and the services available on it. We are not responsible for your misuse of personal information, or for the direct relationship between you and others when takes place outside of the website or our services.